Following two outstanding episodes, Arrow was picked up by The CW for a full season. October 31 ("An Innocent Man"): Oliver still hasn’t figured out how to get back in Laurel’s good graces, but a late night bonding session with Thea gives him the inspiration he needs. Looking into a suspicious murder case, Oliver realizes an innocent man, Peter Declan, was framed by one of the targets on his list. November 7 ("Damaged"): Detective Lance arrests Oliver for murder, and DC Comics’ villain Deathstroke appears in a flashback to Oliver’s days on the island. 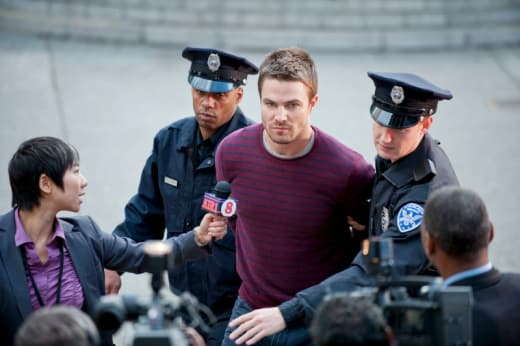 November 14 ("Legacies"): When a gang of brazen bank robbers dubbed The Royal Flush Gang threaten Starling City, Oliver is forced to confront the scope of his mission and decide whether to stray from his father’s list. Diggle pushes Oliver to look past the list and start helping those who really need him. NOTE: The CW has also given us an idea of what to expect on other hit shows. Visit our Vampire Diaries spoilers section to see what we mean. Legacies Spoilers: Miss Mystic Falls, A Blast from Hope's Past & More!